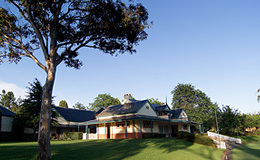 The Bradman Museum & International Cricket Hall of Fame is located in Bowral at the heart of the Southern Highlands in New South Wales. Located just 90 mins drive from Sydney and 100 mins from Canberra, the Musuem is a must see attraction for any visitor. The Bradman Experience is just one of the highlights of a trip to Bowral and the Southern Highlands. Discover the local wineries, boutiques, Restaurants and before you know it you’ve turned it into a two day trip. 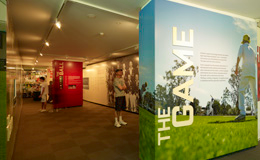 Featuring cutting edge technology, interactive touch-screens and much more, the Bradman Museum & International Cricket Hall of Fame is dedicated to promoting the game of cricket not just to the keen followers of the game but to all who wonder: what is cricket and why is it so important to millions of people around the world? Cricket is Australia’s national summer sport and has become one of the most popular sports, for players and spectators, in the world. After your visit to the Museum, you will have a deep appreciation of cricket, the game Sir Donald Bradman described as ‘the greatest character builder of all our sports’. You will find us in St Jude Street, Bowral, just off the F5 Freeway (Hume Hwy), half-way between Sydney & Canberra. Allow at least an hour for your visit. In fact, go to our Plan Your Visit page to ensure you get the most from your time with us. We are open everyday 10am – 5pm, except for Good Friday and Christmas Day. Here’s just a taste of what you will experience at the Bradman Museum & International Cricket Hall of Fame. 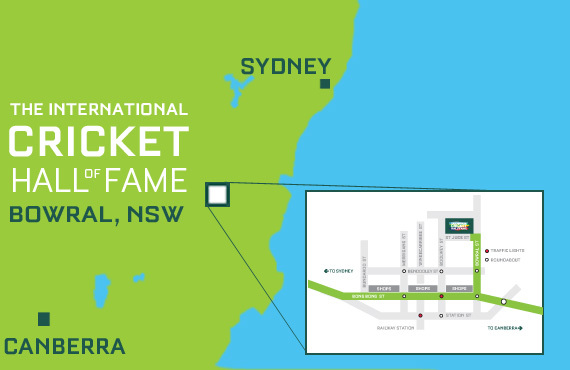 Whether you are a cricket tragic, or simply interested in learning more about one of the world’s most popular sports, the Bradman Museum & International Cricket Hall of Fame provides an exciting and interactive day out for the whole family. Located 90 minutes from Sydney and 110 minutes from Canberra, in Sir Donald Bradman’s home town of Bowral, the Museum incorporates innovative and interactive displays that will engage and inform you. Live footage from around the world, touch screen kiosks, fascinating memorabilia and a contemporary art gallery are just a few of the exhibits that will keep you entertained for hours. The Bradman Museum & International Cricket Hall of Fame is set in the beautiful surrounds of Bradman Oval, and includes Stumps café and a gift store dedicated to the highest quality cricket gear for young players.